classroom management and speeds up IT deployment. How can a simple cart do these things? Technology deployments create new and challenging classroom management issues. One important challenge is how teachers control the distribution and return of Chromebooks that have to be removed from carts, taken to student workstations and returned for storage, charging and protection. Most carts create a management bottleneck, forcing teachers to supervise crowding in front of cart doors or distribute devices in groups, both of which eat away at precious teaching time. 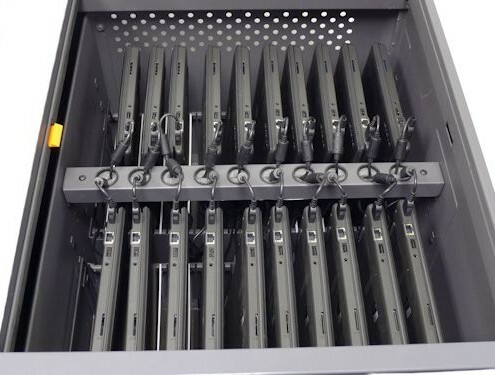 Students and teachers have to bend down to take and replace devices and locking and unlocking these carts is cumbersome, especially with full-sized devices like Chromebooks. Datamation Systems’ Gather’Round carts let students remove and replace Chromebooks from all sides. Some teachers have told us they can save five to ten minutes at the beginning and end of instructional periods, which means more time for learning and less classroom chaos. 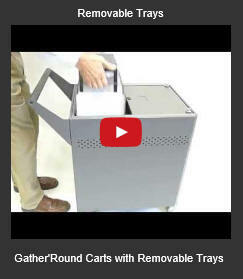 Gather’Round top-load carts are available in capacities of 24, 32 and 40. Tray heights are adjustable to accommodate a range of model sizes. We even have a top-load models designed exclusively for 13” and 14” Chromebooks. Who says a cart can’t make a difference? 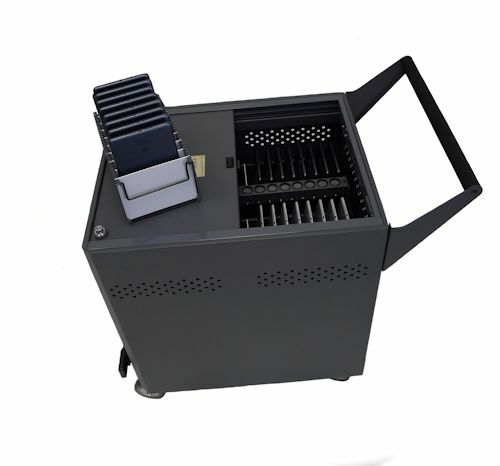 The Datamation Systems Gather’Round carts have sliding top-load doors, so there are no doors that open up into the aisle, blocking access, especially important in crowded classrooms. Teachers and students no longer have to bend down to a few inches from the floor to reach a lower level of Chromebooks. With a top-load design, all Chromebooks are easily accessed without placing added stress on the knees and back, a true ergonomic feature (and safer for students and teachers). 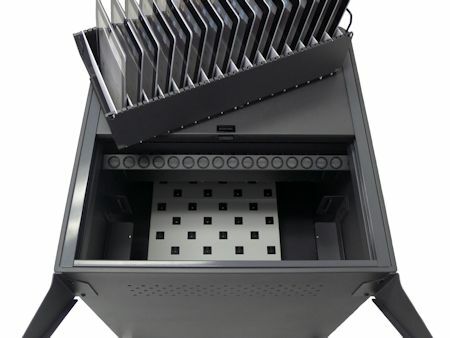 IT managers love the easy, fast set-up and deployment provided by the GatherRound carts unique cable management system. Charging cables are hidden out of view. We have designed an outlet panel with block plug spacing that is universal, accepting any plug types. 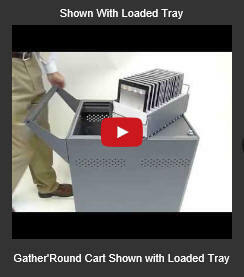 The trays have handles and can be removed from the cart easily. The Gather’Round design allows students to surround the cart to remove and replace devices more quickly (compared with all students crowded around one opening, as on conventional front-load carts). Our push button lock design is secure and fast to use. You don’t need keys to lock the cart, only to unlock it. Again, convenient and quick to use. 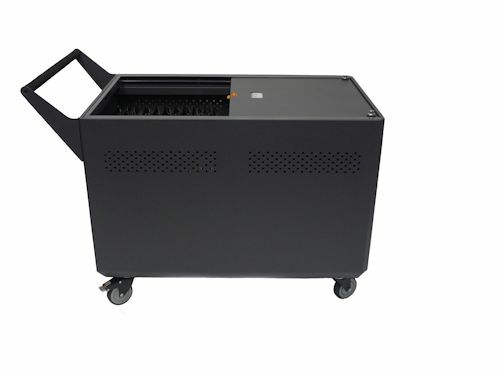 The height of our Gather’Round carts is much lower than that of conventional carts, so students who push the cart down hallways can actually see in front of them, instead of having to peek around a tall side-door style cart. And, when the cart is sitting in a classroom, its low profile preserves the teacher’s precious line of sight. 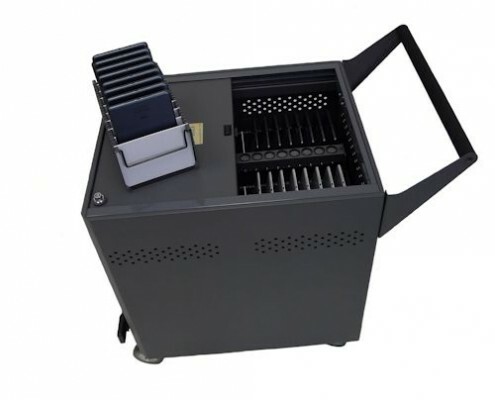 Because Gather’Round carts are more compact, their weight is much less and therefore easier to maneuver, despite the use of heavier gauge, more durable steel construction. Foam padded handles provide additional comfort. Four swiveling wheels are medical grade, durable and quiet. iPad is a trademark of Apple, Inc. GatherRound is a trademark of Datamation Systems, Inc.